The Picture in Picture video mode on iPad is one of the better multitasking features of the device, but some users can find it to be distracting, and some may find themselves entering into the Picture in Picture (PIP) mode accidentally as well. 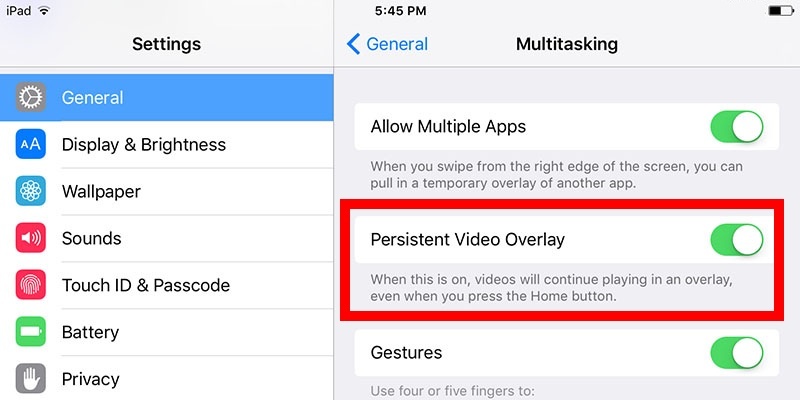 While it’s easy to close a PiP window to make the video go away, if you don’t use the feature, you can easily disable the persistent video overlay (Picture in Picture) ability in iOS, which will prevent inadvertently accessing it. 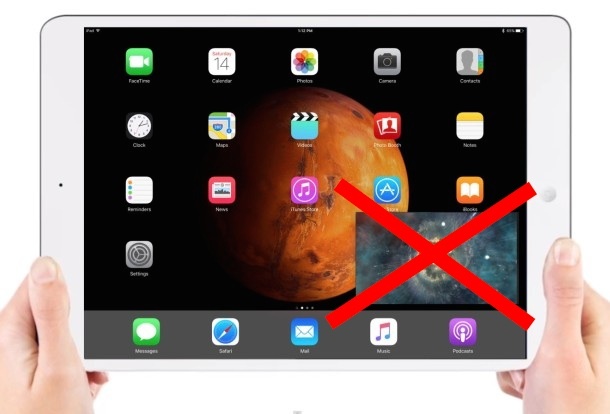 With Persistent Video Overlay disabled, you will no longer have a Picture in Picture overlay pop-up when you press the Home button while viewing a video on iPad. In other words, with PiP disabled, hitting the Home button from a video playing works just like it did in prior versions of iOS, where it would close and stop the video playing, rather than sending it into a video overlay mode. Of course you can easily reverse this as well, and if you discover that Picture in Picture mode is not working or not available on iPad, it’s probably because the Persistent Video Overlay feature has been disabled. Simply retracing the steps above and toggling the switch ON will reverse course and allow PiP to be used again. Right. Multitasking is only available for iPad Air 1st gen, iPad Air 2 and iPad Pro as well as the last two generations of iPad mini (3 and 4). Multitasking includes PIP video overlay and slide over for all those models, and split-screen only for ipad air 2, ipad pro and ipad mini 4. Correction: it’s called split view, not split screen. Thanks for the tip, I liked using the home button to quickly dismiss a video being watched. If I got interrupted, I could quickly stop what I was watching and handle the situation. Now with PIP, I found it a pain to do the same thing. When dismissing the PIP window, stopping the video in it… it never worked 100% of the time; whereas, I press home and its gone. I found this annoying, but never took the time to find a solution. LOL. Youtube belongs to google and google has never been good at implementing Apple’s new features in its apps. Look at what they did with google maps on the apple watch, as opposed to Apple’s own maps app.